Hand-textured stainless steel centerpiece bowl. Stand: approx. 17"L x 16"W x 7.75"H.
The Butterfly Ginkgo Collection celebrates the representation of flora as fauna. Michael's fascination with a particular type of ginkgo tree, the ginkgo Biloba, or "Butterfly ginkgo", which grows with a double leaf reminiscent of a butterfly's wings, gave rise to a fantasia image of the plant. 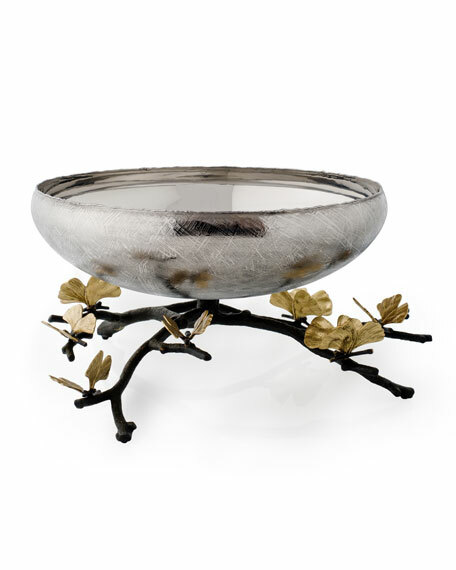 Executed at the highest level of hand craftsmanship, each piece is rendered in solid bronze with acid etched cocoon-shaped vessels. The pieces in the collection are a tour de force of Indian craft and capture the poetic spirit that is so deeply indicative of Michael's work. "The first time I saw this tree, it literally looked like it had been completely overtaken by butterflies ... as if they would all take flight the moment I walked too close or made a noise. The idea that the leaves could evoke the beauty of butterflies was magical to me, like trees that can metamorphose from flora to fauna in the blink of an eye."